The IPL keeps becoming better and better. The 2018 edition witnessed plenty of close finishes and memorable individual performances. The 2 best teams reached the final and put on a thrilling performance. 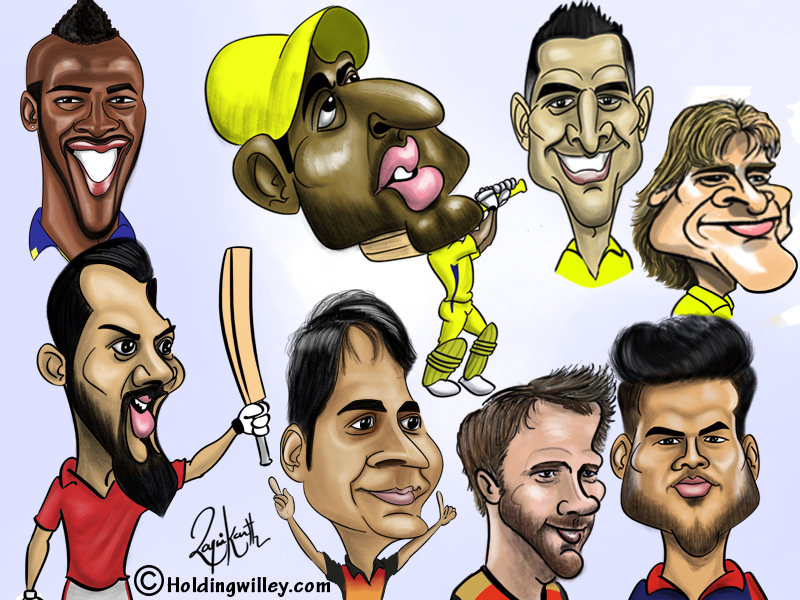 In the end, CSK was the last team standing and clinched their 3rd IPL title in their 7th final appearance. There were some scintillating performances from players who were outstanding and enhanced their reputations. Let’s take a look at some of the hits of the tournament. Rashid is one of the brightest young stars in world cricket and rightly considered the world’s best spinner in T20s. He showed his resilience by coming back strongly after being hit for 4 consecutive sixes by Chris Gayle in a league match. In Qualifier 2, Rashid gave one of the best all-round performances in T20 cricket by scoring 34 in 10 balls, taking 3 wickets in his 4 overs, conceding just 19 runs as well as taking 2 catches and effecting a run out. The reason for his success is that he is difficult to pick because of his quick arm action and unorthodox grip. He took 21 wickets at 21.8 and an economy rate of 6.73 and was the 2nd highest wicket-taker in the tournament. Williamson wore the mantle of captaincy very well and added the Orange Cap for most runs scored to his ensemble. In previous seasons, he couldn’t play many matches due to David Warner’s presence. This time, he showed that it is possible to score a lot of runs at a quick rate by playing normal cricketing shots and relying on finesse rather than power. He also threaded the gaps in the field with the skill and precision of a surgeon, scoring 735 runs at 52.5 and a strike rate of 142.44. Over the last couple of years, Dhoni has copped a lot of flak for his supposed declining skills as a finisher. However, he has got a second wind and he used his experience to good effect by having his best IPL season ever. He took his time to settle in and then launched the big hits as is his wont. He showed his detractors and critics that there is still life in the old dog and carried CSK past the finishing line on many occasions. His performance in this IPL should have convinced all the doubting Thomases about his place in the Indian team for the 2019 World Cup. He scored 455 runs at 75.83 and a strike rate of 150.66. Rayudu has been extremely unlucky not to have cemented his place in the India team, especially since he has done well in the few chances he has got to play for India. In this tournament, he adjusted to batting at different positions and played both pace and spin with aplomb. He did not hesitate to come down the track to both the pacers and spinners and repeatedly hit them over the infield. Dhoni was full of praise and said he had to find a place for Rayudu, who was capable of big hits in spite of not being blessed with a huge physique. Rayudu has been selected in the Indian ODI team to tour England and has a chance to cement his place in the squad for the 2019 World Cup. He scored 602 runs at 43 and a strike rate of 149.75. Watson is 36 years old but he made his experience count with a blistering, unbeaten 117 in the final. He hadn’t opened his account after 10 balls but possesses such power that he was able to make up for his slow start. He unleashed murderous pulls and lofted straight drives in the ‘V’ and was almost unstoppable in the matches in which he got going. He became the 4th player after Chris Gayle, Virat Kohli and Hashim Amla to score at least 2 centuries in a single edition of the IPL. Watson scored 555 runs at 39.64 and a strike rate of 154.59. There is no doubting Pant’s precocious talent and amazing repertoire of strokes. He has long been considered a future Indian player and while he hasn’t made the most of his opportunities at the international level, he has had 2 very prolific IPL seasons. He goes after the bowling from the word go and is not overawed by the reputation of the bowler. Pant was one of the shining stars for Delhi even though they finished with the wooden spoon. He scored 26 runs off a Bhuvneshwar Kumar over, which was the joint 3rd highest number of runs scored in a single over in this edition. MS Dhoni is still going strong but Pant has done enough to show that he can be a capable replacement when the former retires. Pant scored 684 runs at an incredible strike rate of 173.6 with a century and 5 fifties. He also hit the most sixes (37) and made the highest individual score (128*). KL Rahul is one of just 3 Indians to score an international century in all 3 formats but has been unable to find a place in the shorter formats of the game. However, he showed that he deserves a place in the playing XI in all 3 formats with some audacious stroke play in the tournament. Rahul’s biggest strength is his ability to score runs at a terrific clip without resorting to wild slogging and keep his shape even when hitting over the top. He is too good a player to cool his heels in the Indian dressing room. He scored 659 runs at an average of 54.91 and a strike rate of 158.41 with 6 fifties. He scored the fastest ever IPL fifty, from just 14 balls, against the Delhi Daredevils. Tye deservedly won the Purple Cap. He is well known for his assortment of slower balls, yorkers and a deceptively quick bouncer. Ravichandran Ashwin preferred to use him at the death, but whenever KXIP were in trouble, the skipper would bring Tye into the attack and he would provide a breakthrough almost without fail. His knuckle ball was a particularly difficult delivery to pick as it also swung through the air. KXIP flattered to deceive after a promising start to the tournament but Tye was one of the few to enhance his reputation. He took 24 wickets at an economy rate of 8 and a strike rate of 14. Narine was unfazed by the fact that there were doubts over his action. Even with a remodeled action, batsmen struggled to pick his variations. Most teams tended to be cautious against him and did not take any risks with him. He took 17 wickets at 27.47 and a respectable economy rate of 7.65. With the bat, he provided KKR with a lot of explosive starts and was particularly severe against spinners, even though he had his problems with short balls from pacers. He was the 20th highest run scorer amongst the batsmen but had the highest strike rate in this elite list. He scored 357 runs at 189.89 and has progressed in leaps and bounds as a pinch hitter. Russell was one of the premier all-rounders in the tournament and used the long handle to good effect. He was particularly severe on anything pitched up and on a good length, but like Narine tended to be a little circumspect against the short ball. His big hitting dug KKR out of a hole on many occasions. He scored 316 runs at a strike rate of 184.79. As he was recovering from a hamstring injury, he was unable to go flat out with the ball at all times. At times he bowled in excess of 140 kmph and hurried batsmen with the short ball. He took 13 wickets but was a touch expensive, with an economy rate of 9.38.